Phyllis George is one of America's most accomplished women and admired role models. Crowned Miss America in her early twenties, Phyllis has had a colorful career, spanning four decades, as a pioneering female sportscaster, First Lady of Kentucky, entrepreneur, actor and author of six books. Phyllis's life has been no fairy tale, however. She has had to take risks, overcome challenges, and reinvent herself many times in her life. But her indomitable spirit, positive outlook, courage and adaptability have helped her both face and learn lessons from each challenging chapter. 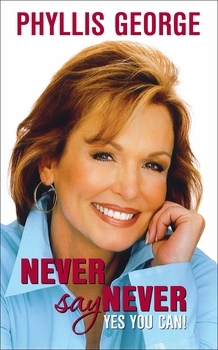 In Never Say Never – Yes You Can!, Phyllis George shares inspiring stories from her own life, as well as those from many of her friends, including Muhammad Ali, Larry King, Paula Zahn, Walter Cronkite, Barbara Taylor Bradford, Roger Staubach, Ann Richards, Michael Bloomberg . . . and many others. Engaging, intimate, and filled with invaluable lessons, this powerful book will help readers believe in themselves, overcome obstacles, tackle life's greatest challenges and, when necessary, reinvent themselves.